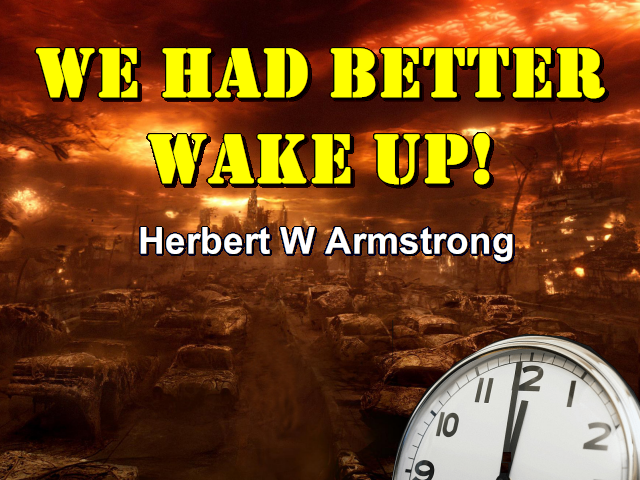 Well greetings friends, this is Herbert W. Armstrong with the good news of the World Tomorrow. My friends, about one third of all of your Bible is prophecy. The prophecies foretell the future of this world and the major world events, the things that are to come. It foretells the condition, the chaotic condition in this world today. You can't understand world news. You can't understand what is going on in this world today; the news commentaries, the newscasts that you hear, unless you first understand Bible prophecy, unless you understand that part of your Bible, unless you understand the other two thirds of your Bible, to know what is the program, what is the purpose being worked out here below, because the prophecies are merely working out that purpose. There you will find the explanation. There you will find that the end of the world is now near, and yet nobody seems to understand it. The end of the world doesn't mean the end of the earth. It doesn't mean that this planet is about to blow up. The end of the earth, as Jesus spoke of it or the end of the world rather, in Matthew 24, when they came to Him and they said, "What's going to happen in the future?" This end of the world has evoked a great deal of comment and a lot of people are; well they just don't understand what it means. The word 'world' here is translated into the English word 'world' from a Greek word, because it was written originally in the Greek language, and the Greek word was 'aeon' and it means 'age'. It means a time span; it does not mean the solid ground and rock of this earth. It is the end of this age, the end of this period. It is the end of the time allotted for our civilization on this earth. What is this civilization? It is the way that man has set up in defiance of God and God's laws. That is our civilization and most of us, my friends, have been so deceived, and we know so little about the work and the purpose and the plan of God that we don't even know what this civilization is. I tell you, it is about time we begin to blow the dust off the Bible and look into it and see what it says because it reveals the meaning of everything in your life, of every event in this world, the general meaning. But when it comes to specific events, Bible prophecy does not specifically mention and foretell every little event that is going to occur on the earth, even events that are large in themselves. Bible prophecy outlines the working out of God's purpose here below. It does outline all of the major steps that contribute to working out that purpose. It shows the working out of God's program, of God's plan on earth and God Almighty is accomplishing a purpose. There is a reason my friends, why you — you individually, I am talking to — there is a reason why you were born, why you were put on this earth, and most of you don't know what that purpose is. And most of you are not fulfilling that purpose at all! You are wasting your time. You don't realize why you are here. You are throwing away precious hours. There is a reason and God Almighty doesn't do things without a reason. Now prophecy gives a general broad outline of the events that are taking place on the earth now, and those that are going to happen. Bible prophecy does tell about World War III, that is, if it is World War III, and we presume that it is. Bible prophecy tells about world wars that have come. It does not specifically even tell us about World War I and World War II, that is specially and individually, each specific war that has occurred. It does specifically tell us of one of the phases of world war that we believe is now the next one that we will call World War III, and it is not coming from the power and the source that we seem to suspect. No, we in the United States, my friends, seem to be so stupid we never can tell where our real enemy is until after he strikes. We can only see one enemy at a time, and I want to tell you that the United States has more than one enemy. Now we fought a war against Germany, World War II and Japan. Of course we said, at the beginning of World War II that we would certainly do away with German militarism and it would never rise up its ugly head again. We were going to demolish it once and for all. And after we got it demolished, now we start to rise it up ourselves, because we think we have to have it as a buffer and a protection against Russia. And some of us, my friends know, not only what we see when we're over there, but we know also what is prophesied, and we know what is prophesied to rise up in Europe. And we know which is the one and the only nation in Europe that is capable of dominating, and which is the economic and the industrial heart of all Europe without which there could be no stability and strength. A human body cannot live without its heart, and the economic and the military body that is to rise up and to restore the Roman Empire, the thing that we least suspect here in the United States, it cannot rise up without its heart. And its heart is in Germany! And I want to tell you that things are coming along over there exactly according to prophecy, and the very thing that our people least expect is just about to happen and is progressing daily. It's progressing feverishly, it's progressing rapidly, and we're sound asleep at the switch and don't realize what's coming and why and we're not taking the right precautions. Well now, let me say this, all of the military precautions we can take are not going to save us anymore. We, my friends, don't realize it, but we have deserted our God and God is the one who determines the outcome of wars. God is the one who saw to it that we actually came out victor in World War I and in World War II. The people of this world don't realize that God has set the various nations where they are. He has set the bounds of the nations the same as He has set the bounds of the oceans when He said to the ocean, "Thus far shalt thy proud waves come and no further" (Job 38:11). And it's the same way with nations, they are exactly where God Almighty put them. God Almighty put Russia over in the center of the continent of Asia, exactly where they are. If they hadn't been there we'd had a lot more trouble than we have a lot sooner than this. I wonder if you ever read in the thirty-third Psalm that God is the one who determines the outcome of wars and all of these things. In verse twelve, the thirty-third Psalm. My friends, you can't understand your Bible. You can't understand prophecy unless you know who He is referring to, and unless you know that we are the people that God chose, unless you know where the United States is mentioned in biblical prophecy. Now if you haven't learned that, you haven't learned the first ABC, the first kindergarten lesson in prophecy. It's mighty important. Why don't you write in, if you have not already done so, and if you have, and haven't studied it, you better get it out, blow the dust off that and look at it and study it again? Our booklet, 'The United States and Britain in Prophecy.' Here is what would ordinarily be a great, large book but it's all condensed in a nutshell, the most fascinating story that you have ever read in your life. It is the general outline of your Bible so far as nations are concerned, and the Bible is very much concerned with nations. The Bible is very much concerned with present world conditions. It does have a very great connection with the spiritual message of the Bible, with salvation, though it is not in itself a message of salvation, and yet there is a connection and it makes it mighty important. Some people say, "Oh well it isn't spiritual, it isn't important." Will you say that a third of your Bible is not important? You know, Jesus went about in a physical ministry of healing as well as a spiritual ministry of preaching the gospel of the Kingdom of God and eternal life and how to be born into the Kingdom of God and to inherit eternal life. He was concerned with the physical condition of people too. You see God made us out of the dust of the ground. God made us matter and God is concerned, and so should we be. We shouldn't be lop-sided, but we should be balanced and we should get the balance of God the way God has it in His own word. So if you don't understand where we're mentioned in the Bible, you can't understand your Bible, especially the prophecies. You can't understand them at all unless you know where it is referring to the United States. Write in for that booklet 'The United States and Britain in Prophecy.' Write in and get your copy, there is no charge, no price on it whatsoever. In just about another fifteen and a half minutes I am going to give you that again. I'll probably be hurrying to get off the air at the close of the broadcast as usual, so you'd better have it ready and write it down right at the minute, don't trust your memory. Alright now, let's read a little of this, the thirty-third Psalm. I wonder if you ever read it. I wish I had the Moffatt translation here, I didn't bring it into the radio studio this time and I have always read it to you in the Moffatt translation. Well here it is in the Authorized, or the King James Version. Let's see, I'd like to go back here and read this eleventh verse. When God takes counsel, what He determines cannot be changed, it's bound to happen, and God has a course that He has prescribed and it's going to happen. My friends, we have forsaken our God. We put on our dollars 'In God we Trust'. Sometimes I wonder if the god we trust in isn't in that very dollar! He looks down, He sees all of us. I've looked down, because I have mentioned to you many times, from the height of one of these airplanes that fly up from eighteen to twenty-two thousand feet, and I can't see a man. Men have gotten so small by the time I get that far away, around three to four miles up, that I can't even see a man, they've passed out of my vision. But God Almighty has eyes that we don't have. He has powers that we don't possess. In other words, human strength, military strength, physical strength, never wins a war. I know most people don't believe that because most people don't know God! And they don't know about God's purpose, and they don't know what God is like, and they don't know of God's powers, and they don't know that God is ever looking right down on this earth and that He is concerned about us and this earth. Most people think that God created something way back here in the long ago, some 6,000 years ago. Some think, well maybe it was a lot more. The Bible indicates it was 6,000 years, but maybe the Bible doesn't know. A lot of people think the Bible isn't inspired of God anyhow, and so maybe there was a God. Now maybe God did create everything that we read of back in the first chapter of Genesis, but His work was all finished, He's gone way off somewhere, He's not concerned about this earth any more. Oh, is that what you think? Let me tell you my friends, God is very much concerned about this earth that He created, and all that He created that you read of in the first chapter of Genesis, was the physical matter, the physical material to begin to go to work on in the real creation, the spiritual creation which was only beginning then and not being finished or completed. He formed man of the dust of the ground and you will find, as Isaiah says that God is the potter and we are the clay (Isaiah 64:8). We're just the mortal clay that the potter is going to work on and we are in a certain mold now and we must be remolded and fashioned and shaped from what we are, from the terrible, filthy, sinning, rebellious creatures that we have turned out to be, that we have permitted ourselves to be, until we're made like Him. And He said, "Be ye holy as I am holy, be ye...perfect...as your Father...in heaven is perfect" (I Peter 1:16, Matthew 5:48). That's what God says, and without holiness none shall see the Eternal (Hebrews 12:14). Without holiness, my friends, you never get saved, and you can't make yourself holy any more than you can pick yourself up by your own boot straps. God can do it and God will do it the minute that you begin to surrender to Him, the minute that you begin to cooperate. But listen, I've said a number of times, it's sort of a partnership deal and God is taking us into partnership. God made us in His image. God is reproducing Himself and as soon as you repent of your sins, as soon as you turn to God Almighty in real repentance, through Jesus Christ as your personal Savior, accepting His shed blood for the remission of your sins, that moment you are reconciled to God. And God is very much concerned about you. And you become, as soon as He puts His spirit in you, which He then promises to do, you become a begotten child of His, and you are an actual child, a son of God. Now listen, are you concerned about your children? There may be a few people on this earth that are not a bit concerned about their own children. Well they're not normal people, that's all I have to say. There is something wrong with them. There isn't anything wrong with God, and God is concerned. And every one of us is either a child of God or a potential child of God. As soon as we will do our part, as soon as we surrender from our rebellion against Him. As soon as we will come to Him. God will not save one single soul He does not govern, and if you are rebellious against God and God's government, don't think you can ever get salvation that way. This nation has forsaken its God. This nation cannot have God's blessing. This nation cannot have God's protection any further, my friends, unless and until this nation, and that means the majority of our people, will turn to God in real repentance and will put down our rebellion, put down doing our own ways that seem right in our sight, and begin to turn to the very word of God and see what God instructs us there and turn to His ways. Yes, He's watching what you are doing. Now you may hear — a lot of people tell you — there are no works any more, that God isn't concerned about works. God is concerned about your works, and you're going to be judged by your works. You don't get SAVED by your works, but you are going to be JUDGED according to your works. And he means war horse here, or military weapons. In this case your horse might be atomic bombs and hydrogen bombs, your tanks, your guns, your ships, your planes, all of the military preparations. That's Bible language, they use the word horse, and sword, and spear, and that sort of thing. But, my friends, we've changed our weapons and we use different weapons today. In other words, it's speaking of the weapons of warfare. There you are, and God will deliver us, and because He has called us for a commission, and He has called us for a mission that we have failed to perform. He has chosen us, as His chosen people, not for favors, not because we are His pets or anything of the kind. God does not love the people of the United States a bit more than He loves the people of Russia. God loves the people of China. He loves the people of Russia. He loves the people of the United States. He is no respecter of persons, but He has chosen us for a job. It's about time we realize it. God has absolute equality. Now the end of the world is merely the end of this time, and God has set a time limit. God has mapped out a period of six thousand years to let man run his own course, his own way, and that six thousand years is almost up. It's going to end a good many years before the end of this twentieth century AD in our time! We're very near the end of it now, and we're rushing madly PELL MELL right into it and into the end of this age, and God tells us what's going to happen between now and then. And catastrophic events, I tell you my friends, are going to happen between now and then and we'd better wake up. We're in a time, as I've been telling you so much as our greatest Statesmen tell us, as our greatest military men, as our greatest scientists tell us, that it is NOW already possible to annihilate human life from off of the earth without warning. And I've shown you that that is both national and personal and individual. It is both a religious persecution on individuals and it is a national invasion that's coming on the United States, on Canada, on Great Britain, on Northwestern Europe, and it is not coming from Russia! You're going to be surprised. Very few people understand the Bible. Very few people understand the prophecies, but then here's what will come and it's coming next. You see there is a religious persecution against the people that have surrendered to God, that love God, that are willing to yield to God's government and to let Him govern their lives, who are earnestly trying to live by every word of God. And some of those people will have permitted themselves to have become a little lukewarm and they're going to be IN this thing that is coming. And for THEIR SAKES God is going to deliver them. But listen, if you are in earnest, if you're filled with zeal, if you're in the very WORK of God that He has given to His people collectively to do at this time to get this gospel of the kingdom to ALL the world as a witness unto all nations, and if you are watching and praying always, you shall be accounted worthy to escape ALL of these things, and nothing is going to come near you. If this nation will wake up, if our nation will heed this warning, no invasion is going to come. And if anyone ever dares invade our nation, God will repel them and put them back, and a lot quicker than He did in World War I and World War II. We were not relying on God in World War I and World War II really. No, we were relying on our military arm; we were relying on our allies. You know that we were. I tell you my friends; I think we don't know what it is to really rely on God. When you rely on God you don't rely on other things along with it, you rely on God as some of the ancient kings of Judah did, and they were really protected, they didn't even have an army. Not very many people have enough faith in God to believe He could protect us without an army today. No, we don't have that kind of faith. And of course as long as we don't have it, we're not going to get that kind of protection either, so I guess about all that's left for the United States is what military protection and allies it can get, because its real security this nation has forsaken. God help us then to come back to our God and to turn to Him. And if the nation won't do it, my friends, God help YOU as an individual to do it. Listen my friends, if you're going to live the kind of life you should, if you're going to escape these things that are coming, you need to know about it. You need to read about the prophecies. You need to know HOW to live a Christian life, HOW to overcome, HOW to MEET the temptations. Jesus Christ said that in these days, and prophecy says, we're coming into a time now when the very people of God are going to be tried and tested as NEVER BEFORE, a time to TRY and TEST God's people, and a good many of them are going to come through and be made — in scripture language — be made white. And that means that they are going to be really cleaned up, and we're going to have the righteousness of God that God will give us. In order to live that kind of life, in order to need these things, you need to study your Bible but you need help. You need to be reading The Plain Truth every month. It will open up the Bible to you as you have never had it before. You need this booklet that I talked about, 'The United States and Britain in Prophecy.' Let me tell you something else you need. You need to enroll in 'The Ambassador College Bible Correspondence Course' and take it right there in your own home, but you'll have to devote a half hour or more, and I know of people that are devoting over two hours a day to this course. That's what you ought to do. Devote your life to it. Make it the FIRST thing in your life. You will find your life will be enriched, it'll be made full, it will be made abundant, it will be happy as it never has before, and you'll come to an understanding that'll be the most precious thing that ever came to your life and you'll have security in the times to come. Now what kind of faith is that? There is more than one kind of faith, and most of you are trusting in a kind of faith that wouldn't save a jack rabbit or anything else. You've been deceived. This book will open your eyes. This little booklet, 'What Kind of Faith.' There's no charge for it. So until tomorrow then, goodbye friends.